In a human lifetime there are are barely perceptible changes in the night sky. The Sun, Moon and planets move relative to the background stars. With good eyesight you might detect the motion of a couple of the brightest asteroids, maybe a naked eye comet appears a few times in a lifetime. You might also track changes in the brightness of a few stars with the naked eye and, if you're really lucky, catch a supernova. But most people are unaware of these subtle changes and they watch the constellations of stars march by in their fixed arrangements from the first time they look into the sky as children until their aged eyes finally close. Over longer periods of time, or with more sensitive light and position measuring devices, we can see the sky change - it is not static but dynamic. To see the changes often requires a long-time baseline but with this information we can measure the slow motion of the stars relative to one another in the sky, detect the changing brightness of stars and galaxies, and have a reference for any unexpected event that appears, like a new asteroid or comet. In the early 1950s the National Geographic Society's Palomar Observatory Sky Survey (POSS) used a 48" (about 122 cm) Schmidt telescope to image the entire sky visible from southern California. At the time, astronomers found POSS invaluable for providing interesting astronomical targets for detailed followup. Modern-day astronomers find POSS invaluable as a reference source to monitor changes in the sky. POSS took about six years to image the sky. While the ATLAS telescopes are much smaller than the POSS telescope we can add images together from multiple nights (we call it "stacking") to detect fainter sources. In just one week of observing, ATLAS will collect enough images to stack together and produce a better survey than POSS! That is 1/300th of the time, due mostly to the sensitivity of modern telescopes that use CCDs rather than photographic plates to capture the faint light from distant objects. 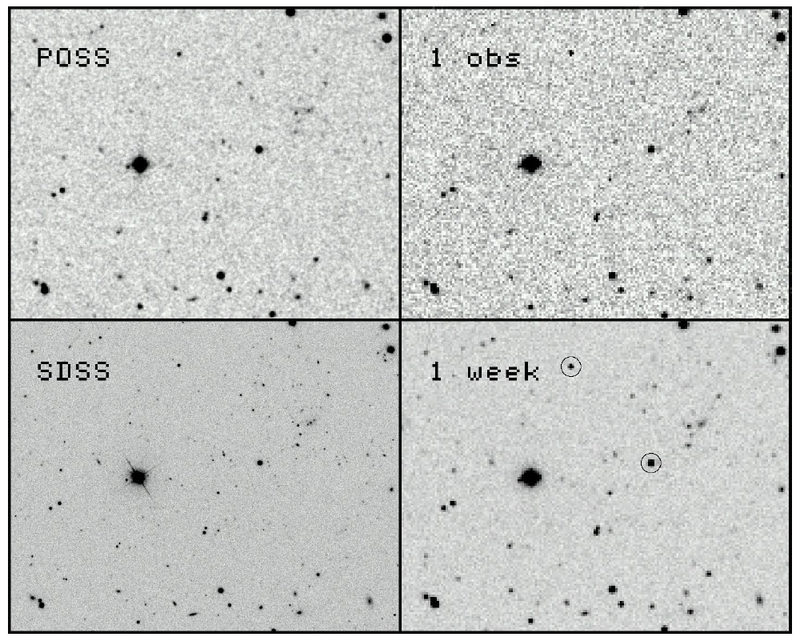 Shortly after ATLAS begins surveying, we will build an image of the entire sky to identify new asteroids and comets, supernovae and novae, variable stars, and GRBs by comparing each new image to our reference "static sky." Our static sky image also will be available on the web.